The United Nations today released details of its greenhouse gas (GHG) emissions for 2012 in the 5th annual edition of the publication - Moving Towards a Climate Neutral UN. The report provides details on the emissions from 64 UN system organizations, covering more than 220,000 staff and hundreds of locations worldwide. 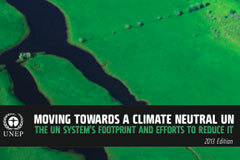 Greenhouse gas emissions totaled 1.71 million tonnes CO2eq across the UN system in 2012. As in previous years, over 50 percent of emissions are from air travel (0.87 million tonnes CO2eq), meaning this remains the biggest challenge to the organization in achieving climate neutrality. Per capita footprint is 7.57 tCO2eq/ staff member, below the UN average of 7.63 tCO2eq/ staff member. Staff travel has decreased by 13%, from 2011 to 2012. Over the next few years we will make further progress. The Secretariat will take active steps towards becoming climate neutral. CO2 emissions will be offset for the 2012-2013 and 2014-2015 bienniums, through purchasing of carbon units via the UNEP Climate Neutral Strategy. “Improving our sustainability performance is a commitment we are taking for the long-term as part of the wider process of strengthening synergies between the chemicals and waste conventions” said Jim Willis, Executive Secretary of the Basel, Rotterdam and Stockholm Conventions. The work on sustainability in the BRS Secretariat is a continuous process that encompasses various environmental aspects, e.g. waste management, energy and water, sustainable travel, etc. This work is undertaken by a team of staff volunteers. For more information on sustainability in the BRS Secretariat, click here. Specifically, the Strategy requires UN bodies to estimate their GHG emissions, to undertake efforts to reduce their emissions to the greatest extent possible and to analyze the cost implications of purchasing carbon offsets. The emissions calculations in the report were compiled using internationally recognized guidance based on the Greenhouse Gas Protocol, a widely used methodology developed by the World Resources Institute and the World Business Council for Sustainable Development. The UN GHG inventory includes emissions from all activities that are under the direct financial control of the organization, such as the heating and cooling of buildings and the travel of its staff members. Follow us on Facebook and Twitter (@UNGtB).